Chocolate fountains are the coolest thing to happen to a party since the frozen drink machine. Paradise Ice Rentals rents only the finest quality fountain and supplies it with chocolate made in the finest Belgian tradition. Combine this with our unsurpassed customer service and you are assured to be completely satisfied with your decision to call us first! Call us to reserve the fountain and tell us what type of chocolate you want to serve (dark chocolate, milk chocolate, or white chocolate). We deliver the fountain to your party, set it up, and get the fountain going. After the party, we will pick up the machine and clean it for you. And there is no run time limit on your fountain rental like many other companies have. Renting from Paradise Ice Rentals means ONE SIZE DOES NOT FIT ALL! Unlike our competitors, we offer you choices of fountain sizes and services to fit your needs. We offer a small, medium, and large fountain, depending on the number of guests you are expecting for your event. The Small 19” Fountain is for parties up to 50 people. They are great for small gatherings, or to be used as multiple fountains at larger parties in order to offer different types of chocolate. The rental price for the 19” fountain is $150* a day and includes two batches of chocolate (5 lbs) as well as bamboo dipping skewers. The Medium 27” Fountain is for parties up to 125 people and is perfect for most home parties or small wedding receptions. The rental price is $220* a day and includes three batches of chocolate (7.5 lbs- enough to feed about 75 people) and bamboo dipping skewers. This fountain holds 12.5 lbs of chocolate, enough to feed 125 people. The Large 34” Fountain is for parties of up to 250 people. The rental price is $310* per day and includes seven batches of chocolate (17.5 lbs- enough to feed 225 people) plus bamboo dipping skewers. This fountain will hold 20 lbs of chocolate, which will serve about 250 people. If you combine a frozen drink machine rental with your chocolate fountain rental, you will receive a $25 discount off of your total rental cost. *Applicable sales tax will apply to the final cost. As with all of our fountain rentals, we will leave you plenty of extra chocolate and you only pay for what you use. Additional batches of chocolate costs $20 per batch (2.5 lbs). Typically every 25-30 people will go through a batch of chocolate in the average party. And, best of all, YOU keep all of the leftover chocolate! Why Are We Cheaper Than Everyone Else? First, we tailor the size of the fountain to the number of guests at your party. Remember our chocolate fountain motto, ONE SIZE DOES NOT FIT ALL. Also, other companies require you to use their attendant and charge you a premium for this service. We do not feel this is necessary! Chocolate fountains are VERY easy to operate. We will personally walk you through operating the fountain, leave you printed instructions, and we are always on call if you need assistance. If you would like an attendant at your function, we will be happy to supply one at $15 per hour. Our attendants are fountain experts and will maintain your fountain as well as answer any questions your guests may have. *IF YOU SOAK OR WASH FRUIT IN WATER OR A WATER/LEMON JUICE SOLUTION, YOU MUST PAT IT DRY BEFORE PUTTING IT OUT TO BE DIPPED. IF THIS IS NOT DONE, THE CUMULATIVE EFFECTIVE OF THE WATER IN THE CHOCOLATE WILL CAUSE IT TO SEIZE AND IT WILL NOT FLOW PROPERLY! ALSO, BE CAREFUL OF PINEAPPLE JUICE FOR THE SAME REASON. What Are Your Chocolate Options? You can also add flavorings to your chocolate. Among the 16 flavors available are amaretto, hazelnut, raspberry, and Irish Crème. The cost for adding flavorings or tinting to chocolate is an additional $15. Other items you can use in our fountains include nacho cheese, barbeque sauce, caramel, and salad dressing. 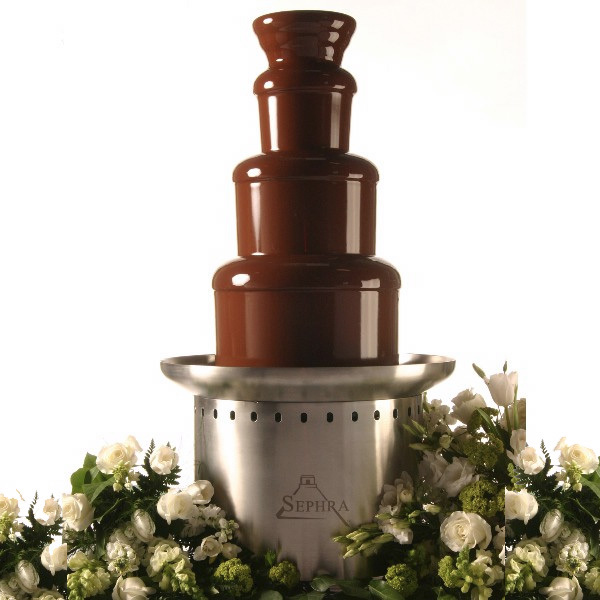 Chocolates fountains make a wonderful addition to Wedding Receptions, Anniversary Parties, Corporate Events, Rehearsal Dinners, and Birthdays, just to name a few. Call 859-663-6000 to reserve a chocolate fountain.